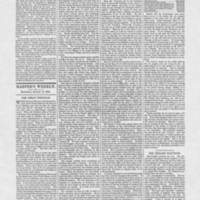 This article was published on August 19, 1865 by Harper’s Weekly, a Republican newspaper, to share its opinions on the Reconstruction efforts in North Carolina with a broad audience. This article detailed the evil of the principle of state sovereignty and how Confederates used this argument to justify their cause. The article stated that white Southerners used it as an excuse for slavery and the repression of blacks. It referred to those who believed in state sovereignty over national sovereignty as ignorant men, who stood in the way of progress. It referred to state sovereignty as the doctrine that would ruin the United States. Harper’s Weekly argued that the method which would allow the most success and protection for all citizens was the belief in national sovereignty. The article highlights the argument of states’ rights versus national authority that continued throughout Reconstruction. "The Great Struggle," Harper's Weekly, August 19, 1865, Harpweek, accessed November 6, 2014, http://harpweek.com. that of sullen acquiescence signify? eignty; and this contest is not yet settled. lar government have gained over the enemy. sume it to be a final victory. pel reconstruction upon their own conditions. in the estimation of the shrewdest observers. disasters of battle by the force of the ballot. their attempt to break out of it. opinion nobody is fool-hardy enough to contend. year 1870 an increase of nineteen members. New York alone could supply those members. ment is in no peril from the defeated rebels. snared in the same trap? non's mouth or the ballot-box. Harper's Weekly, "THE GREAT STRUGGLE," August 19, 1865, Civil War Era NC, accessed April 24, 2019, https://cwnc.omeka.chass.ncsu.edu/items/show/2739.